Central Connecticut Tai Chi Ch'uan (CCTCC) was established in 1989 for the purpose of teaching Tai Chi to people so that they can practice an activity to improve and maintain their mental and physical health. CCTCC offers year round programs in Tai Chi as well as Qi Gong (Chi Kung), meditation, Tai Chi Sword and Sabre Classes, and pushing hand/self-defense classes. CCTCC offers classes at the main location in Meriden and outside programs that run in ten-week sessions in Wallingford and 12-week sessions in Killingworth. Tai Chi can be defined as "relaxed physical movement with a peaceful but focused mind". Tai Chi Ch’uan literally means "supreme ultimate fist". Tai Chi was created centuries ago as an internal martial art that cultivates the chi (internal energy) and combines the natural energy flow with physical movement for the purpose of self defence. Tai Chi Ch’uan is therefore known as the softest of all martial arts. Although Tai Chi was created as a martial art, it is most popularly practiced as a health exercise by millions of people throughout the world. The Tai Chi form is an alternating series of firm and yielding movements. Tai Chi is an internal exercise that is practiced in a relaxed manner to allow the energy to move unrestricted throughout the many meridian pathways that permeate throughout the physical body. The effect is to balance and cultivate the chi for regeneration, healing, and prevention of illness. The early effect of Tai Chi practice is the regulation of blood pressure and stress reduction. Tai Chi is an excellent health exercise activity for men and women of all ages due to the relaxed gentle movements of the form. Tai Chi helps develop better balance and improved mind-body connection, as well as develop a calmer, more concentrated mind. The Tai Chi Form class begins with loosening up exercises to physically relax the joint areas to allow for better energy flow. This is followed with a meridian cleansing Chi Kung routine to begin cultivating the chi. The rest of the class is Tai Chi form instruction in Cheng Man Ch’ings Yang Style, 37-Posture form. This form is taken from Yang Cheng-fu’s original Yang Long Form and is popular throughout the world. Qi Gong (Chi Kung) is the study of internal energy and the practice of cultivating this energy within our bodies. Hundreds of meditation exercises, either sitting or standing, with or without physical movement, have been created to move and cultivate our vital energy known as Chi, or Qi. This Qi is important for improving and maintaining ones health. Qi is the energy or natural force which fills the universe. Man has human Qi, as all living things have their own Qi field which always seeks to be balanced. When energy is out of balance, this is when illness can occur. A balanced energy system is a balance of the Yin and Yang energies. Yin and Yang are opposing energies that are united to make a whole. Pushing hands is the most important part of Tai Chi Self-Defense. Pushing hands practice teaches you to not resist incoming force but rather to withdraw and neutralize this energy while remaining rooted, relaxed, and balanced. 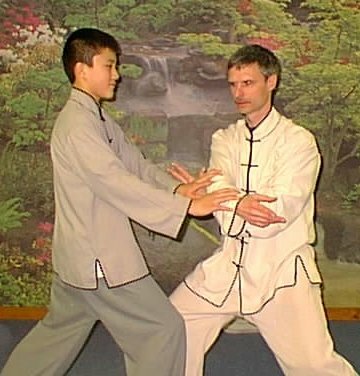 Ultimately, one will be able, with a high degree of sensitivity, to control and lead the opponent's energy, uproot the opponent, and apply one of the many Tai Chi self-defense applications. A good push hands practitioner is soft and yielding, while maintaining a good root and is able to direct the internal energy so as to issue or send energy wherever needed.